Henry Cavill stars in this action-adventure that sees Superman forced to face-off with his biological father's foe, a ruthless General called Zod. Amy Adams and Michael Shannon co-star; Zack Snyder directs. Read our review here. When I confessed by personal ambivalence about the Man of Steel, some of you shared your suggestions for Superman titles that would turn me around and make me Team Supers once and for all! Thankfully, some of these titles are now streaming. Justice League Unlimited (2004) Featuring an ensemble that contains Green Lantern, The Flash, Batman, Wonder Woman, Aquaman, and of course the Man of Steel (plus many, many more), this animated series came highly recommended by Superman fans. Seasons one and two are now available, and within are tons of match-ups of colorful heroes and menacing villains. Plus there's loads of smirking banter and finely crafted action sequences. Oh, and guys, Batman sings the blues in one ep. Literally. Kevin Conroy, George Newbern, and Phil LaMarr are just a few of the actors who lend their voices to this epic animated series. Superman vs. The Elite (2012) In an age where its not super villains but terrorists that strike fear in the hearts of civilians, is Superman's version of justice out of date? When a team of vigilante heroes called The Elite arise and take terrorist to task by playing judge, jury, and executioner, Superman has to stand against them. But it's a battle that will force him to reconsider his own principles. This animated movie is dark, and clued me into an intriguing side of Superman I'd never seen before. George Newbern, Pauley Perrette, and Robin Atkin Downes lend their voices. Michael Chang directs. Superman Cartoons (1942) If you're looking to go old-school, check out this collection of ten cartoons from the 1940s with a total combined running time is just shy of an hour and a half. The animation is Looney Toons level, but there is something undeniably charming about these animated adventures that utilize Superman standards from The Daily Planet, scoop-seeking Lois Lane, and Krypton. Also, there's a T-Rex trouncing Metropolis, and Superman doesn't fly yet! He literally leaps from one tall building to another to traverse the skyline. While the previous Superman offerings might be too much for younger audiences, this one is suitable for the whole family. During a celeb-stuffed party at James Franco's house, the apocalypse descends. After sinkholes and unexplainable mayhem lay waste to most of the partygoers, Jonah Hill, Seth Rogen, Jay Baruchel, Danny McBride, and Craig Robinson flee back with Franco into his obnoxious home to try to escape the end of the world. Dark humor and self-parody unfold. Michael Cera, Emma Watson, and Mindy Kaling co-star. Evan Goldberg and Seth Rogen direct. Read our review here. The key to self-parody is essentially this: figure out what your public persona is, then either flip it totally on its head, or amp it up to 11. The stars of This is The End manage this with outrageous jokes and visual gags that can't be unseen. Basically, they are in good company with the self-mocking stars below. Being John Malkovich (1999) Perhaps the most perfect example of an actor poking fun at their own persona, John Malkovich co-stars in this twisted dark comedy about love and identity, not only playing himself as a pompous performer but also playing versions of himself as overtaken by puppeteers who've invaded his brain. And then of course there's the scene where he plays absolutely every role. John Cusack, Cameron Diaz, and Catherine Keener co-star. Spike Jonze directs. 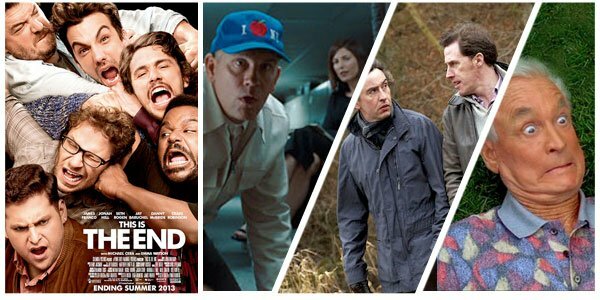 The Trip (2010) Following their ego-free self-parody in the heady 2005 comedy Tristram Shandy, Brit wits Steve Coogan and Rob Brydon reteam for this "documentary" that follows the pair of frenemies on a trip across England on which they dine on gourmet cuisine and relentlessly compete for attention and laughs. Michael Winterbottom directs. Happy Gilmore (1996) For something as gleefully mindless and goofy as This Is The End, revisit this early Adam Sandler vehicle. Sure, the plot revolves around a failed hockey player's hijinks-studded efforts to get into the pro-golf circuit. But one of the film's most memorable moments is when Price is Right's legendary host and animal enthusiast Bob Barker gets into a brawl with the cocky golfer. Julie Bowen co-stars; Dennis Dugan directs. 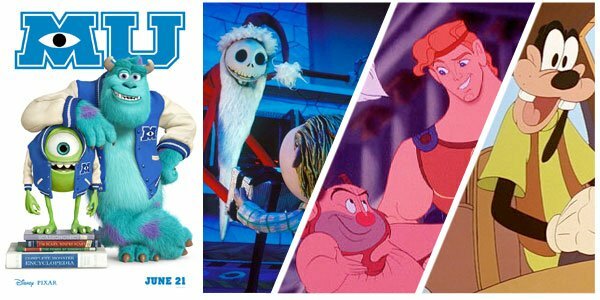 Before they were best buds working side by side at Monsters Inc, Mike and Sulley were classmates at Monsters University. But they didn't start off on the right foot. In fact, they kind of hated each other. John Goodman and Billy Crystal reprise their roles. Dan Scanlon directs. Read our review here. Despite being a prequel, this Pixar effort is garnering great reviews. But if you want more stories of monsters, heroes reaching their potential, and cartoon college tales, we have got you covered! The Nightmare Before Christmas (1993) In this collaboration between Tim Burton and Henry Selick, we learned that monsters have dreams too! Sure, Jack Skellington is at the top of his game as a scarer on Halloween, but he dreams of a new challenge…like Christmas. Convinced he can do a bang-up job of marshaling in this chipper holiday, he and his creature colleagues kidnap Santa and essentially steal Christmas, much to the chagrin of children who find toys that could kill under their trees. Danny Elfman, Chris Sarandon, and Catherine O'Hara lend their voices; Henry Selick directs. Hercules (1997) In Greek mythology, Hercules is the ultimate hero and a literal god. But in this Disney adventure, his story gets lots of color and a gospel chorus! Having been snatched from his place on Olympus by coup-planning Lord of the Underworld Hades, Hercules is left on Earth as a babe in the wilderness. No longer immortal, but still with superhuman strength, this son of Zeus must reclaim his place among the gods by proving himself a true hero. Tate Donovan, Danny DeVito, Susan Egan and James Woods lend their voices; Ron Clements and John Musker direct. An Extremely Goofy Movie (1999) Going to college is an experience that for many cements our independence from our parents. Unfortunately for Max, he is followed to college by his newly unemployed father, who is well meaning but…well, goofy. Watch the trailer for this and tell me Arrested Development season 4 doesn't share some eerie similarities. Bill Farmer, Jason Marsden, and Pauly Shore lend their voices; Douglas McCarthy directs.